Make sure those bad guys are off the street, because this cute little officer means business. 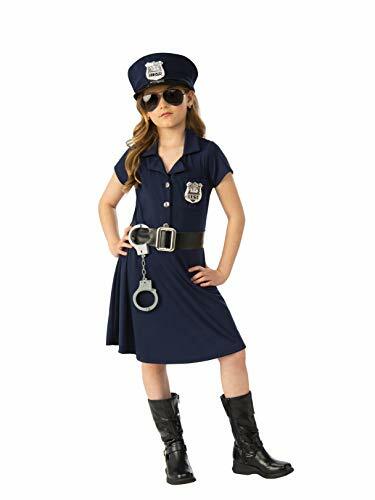 This Police Officer costume comes with a button-up dress with belt, handcuffs, hat, and badges (2). Sunglasses and boots not included. This protector of the Peace has it all under control! 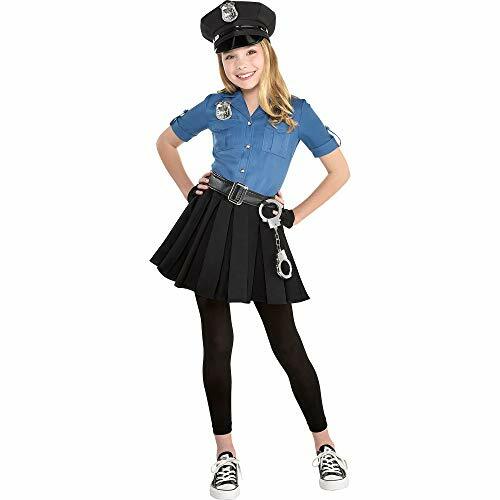 She also has the look of authority The classic police officer costume for girls features a realistic police shirt with an attached silver badge, button-down pockets, and an attached black necktie. 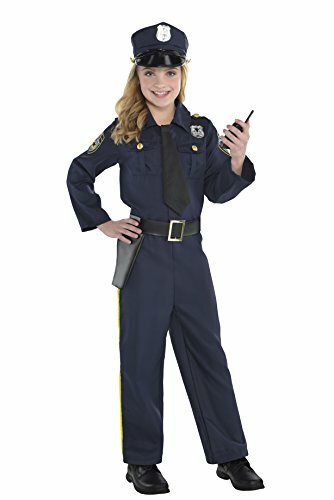 Finish off this cop costume with matching pants, a police hat, a faux leather belt with a holster, and a toy walkie talkie. Shoes not included. 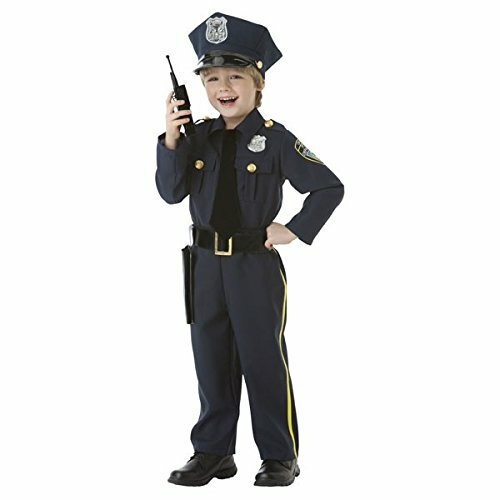 Transform your little one into a police officer in this Police Dress costume. 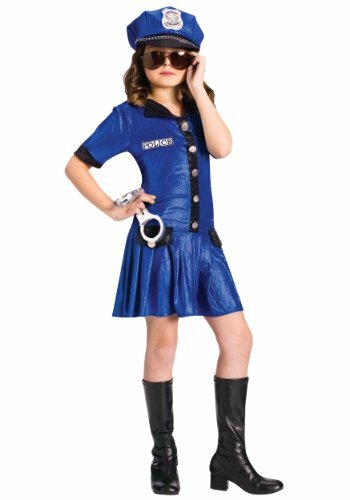 This cop costume features a dress designed to look like a blue shirt and a black skirt, a police hat, a belt, a pair of glovelettes, a pair of handcuffs, and a pair of tights. She will look like an official member of the Blue. Whether you choose to save their costume for future events or pass it on to a friend, you'll always have the memories of them smiling from ear to ear in this picture-perfect Halloween costume. This little girls Halloween costume is also fun to put on for themed birthday parties, sleepovers, and other occasions. It is made from soft polyester making it comfortable to wear. 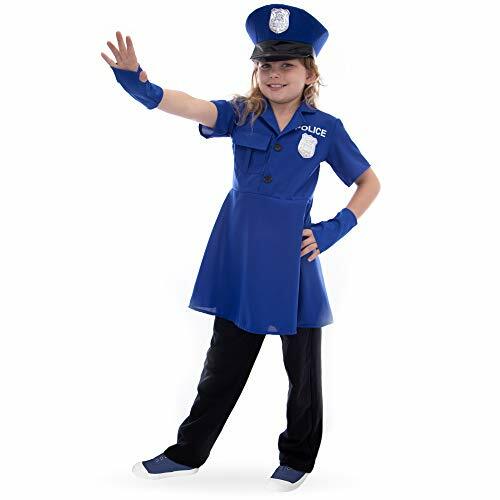 This police officer girl costume is a short metallic blue dress, with black collar, short sleeves with black trim, police logo, silver buttons, and A-line skirt with black pockets. This Halloween Costume also includes a black and blue logo hat. Welcome to the Force!You've passed basic training and you're ready to take on your first assignment as a policewoman in this Proud Police Officer costume. This Boo! Inc. costume comes with a police hat, gloves, dress, and belt, everything needed for your first night on the job, even a silver badge on the dress. Detective on duty!Wear this for Halloween trick-or-treating, theme parties, and costume contests. Collect all the candy you can, but save some for your mummy. And when Halloween comes to an end, dress up and play pretend all year round. You're in for a spooktacular treat with this one crime-stopper of a costume!Handle With Scare:This unisex children's costume is made with 100% polyester, no hocus pocus materials. Were you caught in a dark and stormy night? Hand wash your eerie outfit and hang it out to dry. To prevent colors from bleeding, avoid bleaching or ironing this attire. Follow the size chart for a scary good fit. 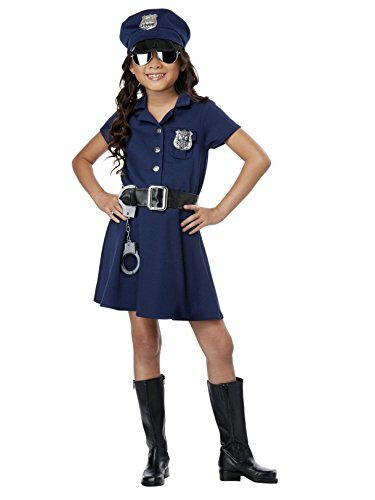 Police Officer Kids Costume includes navy blue police dress, black belt, plastic handcuffs and two officer badges. 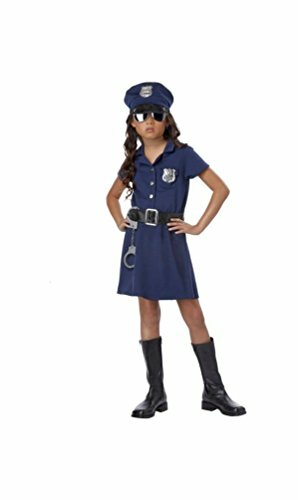 This wonderful Police Costume for girls is available in kids sizes Small (6-8), Medium (8-10), Large (10-12) and X-Large (12-14). Hands up! Here is the new pretty officer!Please note hat and boots are not included. You have everything you need to go out and fight crime when you were wearing this police officer costume! Including Police hat, badge and shirt, you have a simple, classic and complete costume that is perfect for Halloween or any occasion year round! Made of high-quality comfortable material! Order yours online today! 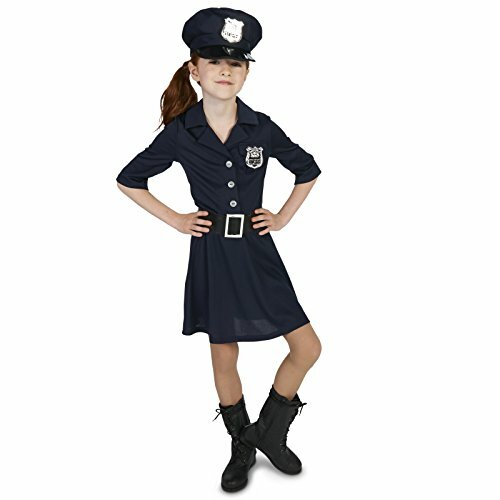 Our In the Line of Duty police girl dress is great for the fashion forward child. Perfect for Halloween costume for girls of all ages. 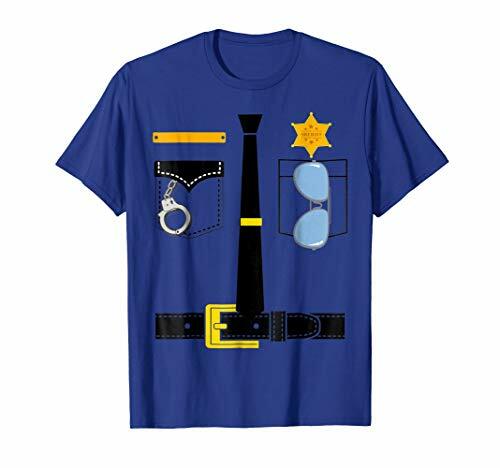 This Police Uniform Costume Halloween Kids T-Shirt is also great for adults to wear at costume parties!